The Manila Floods: Why Wasn't the City Prepared? A small band of U.S. and Philippine soldiers were on their way to pick up supplies for a local school on the southern Philippine island of Jolo on Sept. 29 when their vehicle rolled over a land mine. The blast killed two U.S. soldiers and one Filipino marine, and though authorities are still investigating the incident, analysts immediately pointed the finger at the militant Islamic separatist group Abu Sayyaf known to be active in the area. Much to the frustration of military advisers who want them in bigger conflict zones, the U.S. military keeps a small number of highly skilled soldiers in the southern Philippines to help train local troops in their ongoing fight against Abu Sayyaf, which the U.S. State Department believes has only between 200 and 500 active members today. The Philippine military told a reporter that the U.S. troops in the Sept. 29 incident were not involved in any combat operations but "were just there to help in building a school." The deaths were the first U.S. military casualties to occur in the Philippines since 2002, when a bomb, most likely planted by Abu Sayyaf, exploded in a bar on the island of Mindanao, killing one American soldier. Abdurajak Abubakar Janjalani, a former Filipino Islamic scholar who battled the Soviets in Afghanistan in the 1980s, founded the fundamentalist Abu Sayyaf in 1991, splitting from the Moro National Liberation Front (MNLF)  a more mainstream Islamic political organization fighting for increased autonomy for Muslims in the southern Philippines  after the MNLF engaged in peace talks with the government. Abu Sayyaf has always said it is fighting for an independent Islamic nation in the southern Philippines, but during the late 1990s, the movement began to show cracks, and members started behaving more like a gang of well-armed bandits driven by greed, not creed. Since about 2002, however, the extremist group has been reverting to its original separatist goals, and its bombings and assassination attempts have increased accordingly. In the early 1990s, Osama bin Laden's brother-in-law funneled money into Abu Sayyaf through a fake Islamic charity in the Philippines. Abu Sayyaf, which means "barrier of the sword," carried out its first attack in 1991, killing two American evangelists with grenades on the southern island of Mindanao. As the 1990s unfolded, the group's body count in Mindanao steadily rose. In 1994 the Philippine army blamed Abu Sayyaf for a series of bombings in the Philippine city of Zamboanga that killed 71. The following year, Abu Sayyaf raided the town of Ipil, leaving 53 dead, and in 1998 a grenade attack on a department store injured 60. But after its leader, Abdurajak Abubakar Janjalani, was killed in a gun battle with police in 1998, the militant group changed course, stopping its bomb attacks and kidnapping potentially rich foreigners for ransom money to fund operations and gain support from local communities. In 2000 the group kidnapped 21 people  19 of whom were foreigners  in Malaysia, 50 students and teachers from two schools on the island of Basilan, and at least 15 foreign journalists, including one reporter who was kidnapped and released twice. When Abdurajak's younger brother Khadaffy Janjalani took complete control of the group sometime around 2002, Abu Sayyaf renewed its ideological fervor for independence and refocused its efforts on bombmaking. In 2004 the group took responsibility for the most deadly terrorist attack in the history of the Philippines: the 2004 bombing of a ferry in Manila Bay that killed 116 people. By mid-2005, the Philippine government says Jemaah Islamiyah, the Southeast Asian terrorist group responsible for the 2002 Bali bombings that killed 202 people, had trained some 60 members of Abu Sayyaf to make bigger, better explosives. Two Jemaah Islamiyah bombmakers connected with the Bali bombings are still believed to be working with Abu Sayyaf. Abu Sayyaf appeared, however, to lose ground after the army launched a major offensive against the organization in August 2006. Shortly thereafter, Khadaffy Janjalani and two other high-ranking Abu Sayyaf leaders with important connections to funding in the Middle East were killed. According to one analyst, Abu Sayyaf is running low on funds, and no new leader has come forward to unite the disgruntled factions within the group. And once again, Abu Sayyaf is back to kidnapping for ransom money as a means of funding its operations. In January, the group held three Red Cross workers hostage, and analysts suspect they were released only after large ransoms were paid. Since 2001, when an American citizen was beheaded, about 600 U.S. special forces have rotated in and out of the southern Philippines to train the Philippine armed forces. But after eight years of U.S. training and hundreds of millions of dollars in aid and military assistance, the Philippine government still has not defeated the relatively small separatist group, and since 2007 progress seems to have stalled. 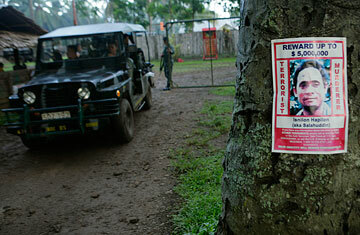 The U.S. military presence in the Philippines has long been a contentious issue. Recently, Philippine senators have urged President Gloria Arroyo to renegotiate the agreement that allows U.S. troops on Philippine soil, and the deaths of two U.S. soldiers will surely incite more debate. The Sept. 29 deaths, though, demonstrate that one thing is certain: Abu Sayyaf is still a dangerous, desperate terrorist group.